It's here, folks! The one you've been waiting for. The Bruins get to the team that everyone is looking for, ahead of them in the Atlantic. It's not exactly a match-up, however: the Bruins are without their leading goal scorer in David Pastrnak, while the Bolts will be playing their second game in as many nights. The Bruins have been on a point of pace in February, but they are made virtually no ground on Tampa. Why? The Bolts harbor has been in regulation since January 30th, a 4-2 loss to the Penguins. That's a 13-game point streak. It's not just a point streak either: going into last night's game against the Rangers, Tampa had won 9 games in a row. If the Bolts took at least one point from the Rangers last night, this has to be one of the more unique streaking games in NHL history, right? I can imagine two teams on 14-game point being faced each other many times. Patrice Bergeron did not practice on Wednesday, but per team, he was given a maintenance day. He should be good to go tonight, while Noel Acciari may miss time to dental work and Kevan Miller remains questionable. Jake DeBrusk appears to be no worse for wear after an awkward fall in Tuesday night's game against San Jose. ] Karson Kuhlman will probably draw back in. 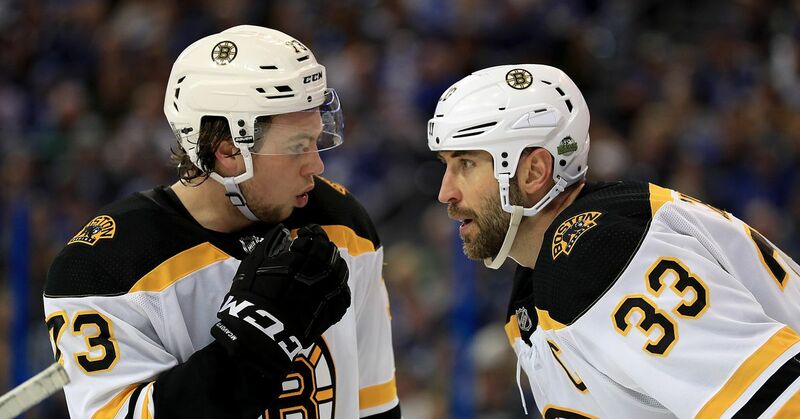 If not, Bruce Cassidy could opt to bump David Backes down to the 4th line and lock Peter Cehlarik at 3RW. Tampa took the only other regular season meeting between these two teams, beating the Bruins 3-2 in Tampa back on December 6.